The weekly (I hope) “What’s in the Box?” feature is all about comics. I tweeted a picture last week of my entire, boxed comic book collection. I buy comics to this day but the collection is getting out of hand. So, over the weekend I pulled all the boxes out and started looking through them to see what mattered to me and what I could part with. While that process will be a long one, I was struck by how much really good stuff I had in the collection. Lot’s of bad stuff is in there too but we won’t worry about that just yet. This experience inspired me to create a new column for the site. Each Wednesday I will pull a book out of one of the boxes and read it and then write something about the book. Why Wednesday? Well Wednesday is new comic book day of course! It’s the day all the local comic shops put their new books on the rack. Makes sense don’t you think? The book I pull won’t necessarily be at random. It will be something I want to read again, something I think is significant, it will be a book I particularly liked, or maybe I will pull it for some other reason. I don’t really know yet. We’ll see how it plays out. Now, on to our first book. I remember this book, this entire series actually, from my Second Age of comic book collecting. I think more than anything I was drawn to this book initially by it’s cover. The early 90’s was a dark period in the comic book industry. Companies were using any gimmick they could think of to get people to buy the books. Foil covers, hologram covers, textured covers, and tons of other stuff. 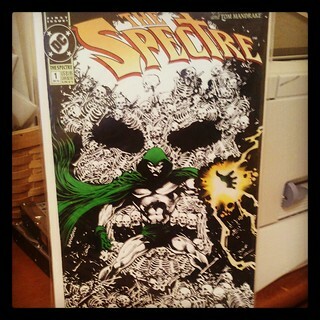 DC was no exception and the first issue of the new Spectre series got the gimmick treatment with a glow-in-the-dark cover. I thought the art on the cover was pretty interesting and the gimmick was fun so I picked this series up without really knowing much about The Spectre. It turned out to be a great book and I have 41 of the 62 issue run. The run was written by John Ostrander who studied to be a priest but eventually found his way into writing comics. Logical progression I guess? Anyway, his theology found his way into the book. The Spectre, at least in this incarnation, is the physical embodiment of the wrath of God. Jim Corrigan was a police officer that was murdered and was turned into The Spectre and given the mission of delivering God’s vengeance on the wicked on Earth. Throughout the series Jim constantly struggles with doing what he has been tasked to do even when he doesn’t always agree. Jim grows weary of his task and questions both why he can’t be set free and why it seems no matter how much judgement he passes, the world never seems to get better. The book grapples with questions of morality and duty all with a metaphysical backdrop. It’s a great run and quite a bit under appreciated I think. This first issue sets the stage for the rest of the series. Jim has been The Spectre for 50 years and has been fighting evil that entire time. He is tired, nothing is changing and want’s to know why. He decides to find the last person connected to his death in hopes that by delivering God’s judgement will free him at last. Jim finds out a little more about his own death but ultimately remains The Spectre. Art wish, Tom Mandrake is perfect for this book. Ostrander and Mandrake worked together quite a bit but they really hit their stride here. Mandrake really captures the surreal during The Spectre’s encounters with the damned. I know he is not the artist on every book in the series but he is on most of them and I always enjoy when a creative team can stick together. I’m trying to find the complete run of this series now so I can read it from start to finish. Good books are sometimes overlooked and I think this is one of them. And by the way, yes, the book still glows in the dark. I dig the Specter and have been collecting this character in all his hosts, from the old school to Hal Jordan, but my favorite is Chris Allen. Today I got the comic you reviewed and am excited to read it, but I was shocked to learn this cover glows I the dark. Cool stuff. I don’t have much to say other than I’m glad you like the Specter too. If you haven’t read any of this version of the character then you are in for a treat. It’s a really great run. Yes, the original version of that book is glow in the dark. I have the same cover. I think several of the issues of that run have special covers. Unlike other books from the time, however, this book has great stuff on the inside as well.